6th February 2015. This week’s Reserve Bank interest rate move surprised virtually everyone, bringing the cash rate to 2.25%, yet another historic low. Despite Australian Treasurer Joe Hockey suggesting the rate cut means “the shackles are off the Australian economy,” the cut is unlikely on its own to kick Australia’s GDP growth rate back to trend level. But with a little help from friends offshore and a light touch from APRA, the rate cut just might work. Let us review for a moment how a lower cash rate can boost the economy – the so-called “transmission channels” for monetary policy. There are three. First, rate cuts change asset prices, including foreign exchange rates. Second, rate cuts should reduce the cost of capital, all else being equal. Third, rate cuts should increase the availability of credit from banks’ balance sheets. All three elements are important considerations in yesterday’s move. Asset prices moved according to expectations, with the ASX rallying 1.4% on the news. The main game, however, was the exchange rate. Many commentators have focused their attention on the AUD-USD exchange rate, which fell by 1.5 cents immediately after the rate cut. Was this the RBA’s main target? The AUD had already depreciated significantly against the US dollar, with the AUD-USD as of 2 February already 15% below its average over the first half of 2014. At AUD/USD0.7769 as of 2 February, the benchmark rate of exchange was very near the level that RBA Governor Glenn Stevens had indicated was desirable. What had not moved perhaps as much as the RBA might have liked was the trade-weighted index, which measures the AUD against a basket of the exchange rates of our major trading partners. The TWI had declined only 10% relative to its average rate across the first half of 2014, making the AUD the unwilling strong man in a world of “currency wars” depreciation. The ECB’s decision in late January to engage in its own version of quantitative easing - which sent the AUD back up above the AUD-EUR0.70 level, may have been one of the straws that broke the camel’s back and contributed to this early rate decision. As of Tuesday, the TWI had dropped to below 63 for the first time since July 2009. This is welcome relief. But it can only last so long as other major central banks outside the US co-operate by avoiding further easing of their own. What is likely to prove more important - and more durable - is a lower cost of capital and the potential to spur investment through greater availability of banking credit to the economy. 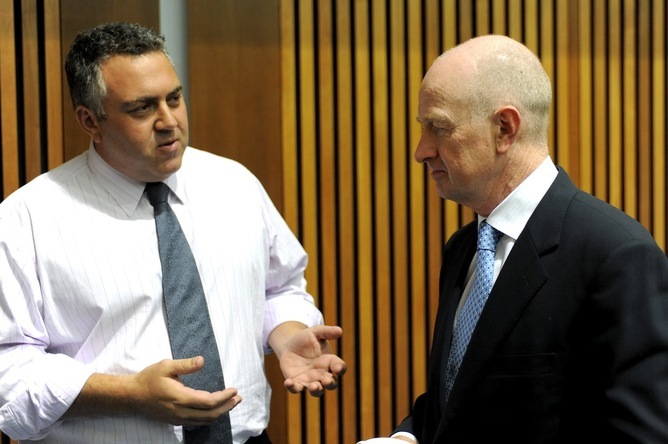 Here, too, the RBA needs help – from the Abbott government and APRA. There is not a great deal of evidence to date that a lower cost of capital – with a historically low 2.5% cash rate already in place for a year – has induced an increase in investment in the Australian economy outside the property sector. Capital expenditure by firms has been largely limited to the resources sector, and is now petering out. The household savings rate remains high, while the debt-to-asset ratio has fallen. This suggests households are electing to increase their equity in current investments rather than using leverage to expand their investment portfolios. Within the property sector, credit continues to grow at a relatively rapid pace, with credit growth for investment properties far outpacing the expansion of credit for other purposes - whether household or business. In 2014, credit to purchase investment properties appears to have accounted for about 35% of all new credit creation in the economy. No wonder critics worry that the RBA’s rate cut has the potential to stoke excessive leverage in the property market. The question becomes whether there are other triggers that can be pulled to encourage more credit to flow into other types of investment in the Australian economy. Ideally, that would be a renewed expansion of business credit to support increased capital expenditure, and eventually business activity and employment. The RBA cannot dictate that looser monetary policy be directed toward the business sector. But the Abbott government and APRA have in hand the tool to provide a not-so-gentle nudge. Will the government act on Murray’s advice? We are merely weeks away from the deadline for final feedback to the Financial System Inquiry, led by David Murray. A key recommendation of the inquiry was to raise banks’ average internal ratings-based risk weights on mortgages to narrow the difference between the mortgage risk weights used by authorised deposit-taking institutions and the “standard” risk weights used by other institutions. In shorthand, this recommendation would force the Big 4 banks to hold more capital against their mortgage books, making the mortgage-writing business relatively more expensive (and less attractive) from a capital perspective. This recommendation makes sense. The post-2008 boom in investment property has been driven in part by investor demand – but also in part by the Big 4 banks being willing underwriters of residential real estate. This willingness has in turn been driven, at least in part, by the regulatory setting that makes mortgages one of the least capital-intensive – and therefore cheapest to produce – lending products in the Australian market. The movement in regulatory control will have an impact by stimulating foreign exchange trading. Reducing this regulatory incentive to lend into the property market holds the potential to increase the appetite among the Big 4 for other types of lending, including business credit. It is a reform that the Abbott government and APRA can hang their hat on in 2015.